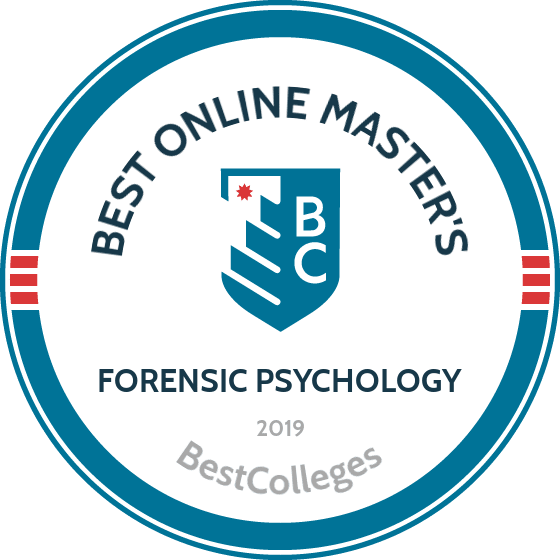 What Are the Best Online Forensic Psychology Master's Programs? What to Expect From an Online Forensic Psychology Master's Program? An online master’s in forensic psychology prepares students to work in the criminal justice field. Graduates use psychological methods to analyze criminal behavior and gain knowledge required to work in corrections, private consulting firms, the government, social services, and higher education. According to the Bureau of Labor Statistics (BLS), the demand for psychologists is projected to increase by 14% between 2016 and 2026, which is more than double the average growth rate for all U.S. professions over the same timeframe. By earning a master’s in forensic psychology, you’ll stand out in the psychology and criminal justice fields. Many graduates of forensic psychology online master’s programs continue their education to pursue doctorate studies and become licensed forensic psychologists in clinical practices. Online forensic psychology master’s programs provide a variety of skills needed to advance your career. Students identify, interpret, and understand criminal behavior. They also learn about techniques and recent breakthroughs in forensic psychology. Graduates often find work in the legal and criminal justice systems or continue their studies at the doctorate level. Most online master’s in forensic psychology programs don’t require applicants to have previous work experience, but do request a bachelor’s degree, usually in a related field. Prospective students with previous relevant work experience may increase their chances of being accepted into a program. To find the right online master’s degree in forensic psychology program, consider what factors are most important to you. Things to consider include tuition cost, program length, part- or full-time enrollment options, types of courses and concentrations available, prerequisites, faculty, and internship or practicum requirements. CAN I WORK WHILE I COMPLETE MY ONLINE MASTER’S IN FORENSIC PSYCHOLOGY? Being able to work while completing a degree is one of the advantages of completing a master’s in forensic psychology online. Online students can set their own schedules, logging on and reviewing course materials when it’s most convenient. Completing a forensic psychology master’s online also means that no matter where students live and work, they’ll find a program that fits their lifestyle. Established in 1964 in Miami, FL, Nova Southeastern University is a private school that boasts nearly 200,000 alumni. The school enrolls more than 20,000 on-campus and online learners each academic year. Students pursuing NSU's MS in forensic psychology can complete the program without ever setting foot on campus. The 36-credit online forensic psychology master's takes two years of full-time study, with students completing an interdisciplinary curriculum that combines the study of law, health services, forensics, and mental health. In addition to coursework, the department frequently hosts free webinars by faculty that focus on emerging areas of the field. The program is designed for professionals who reside in rural areas and those who work nontraditional schedules. Students complete 24 core credits, nine credits in a specialization, while a capstone project requires three credits. Specializations are also available in forensic psychology in the legal system, or forensic psychology for mental health workers, first responders, and disaster teams. Learners can decide if they want to complete a thesis or a field experience; however, those planning to continue their education should choose the research option. Common coursework includes methods and tools of psychological and violence risk assessment, gender violence, communication skills in expert witness testimony, and behavioral criminology. NSU maintains regional accreditation through the Southern Association of Colleges and Schools. As a member of the University of California system, the Irvine campus is considered one of the premier public research institutions in the nation. The school offers numerous undergraduate and graduate degrees to its 35,000 students, including the master of legal and forensic psychology. This online master's in forensic psychology is a multidisciplinary degree offered jointly by the Department of Psychological Science and the Department of Criminology, Law, and Society. Learners complete 52 credits over the course of two years, and while most coursework is online, all new students must visit the Irvine campus at the start of the program to complete an introduction to legal and forensic psychology. Distance learners usually take this five-day class in September. The curriculum also covers topics such as legal and social responses to domestic violence, clinical interviewing and treatment, mental health and the law, and compliance and enforcement within law and behavior. Rather than completing a thesis, online students complete a capstone course and write an independent term paper that demonstrates the growth of their knowledge. To apply, applicants must demonstrate a 3.0 minimum GPA and supply a personal history statement, resume, statement of purpose, and three letters of recommendation. UC Irvine does not require GRE scores at this time. Regardless of residency, distance learners pay $13,974 per academic year. With its main campus in Stillwater, OK, Oklahoma State University operates six extension campuses throughout the Sooner State, as well as a thriving distance learning program. The School of Forensic Sciences offers an MS in forensic science online to accommodate working professionals looking to advance their careers. In addition to core studies, the department provides concentrations in areas of arson and explosives investigation, forensic document examination, and forensic science administration. Students complete 39 credits on either a part-time or full-time basis. Full-time learners can graduate in 2-3 years, while part-time students may need up to four years. The curriculum of this online master's in forensic psychology program includes coursework in criminalistics and evidence analysis, ethical research and scientific writing, quality assurance in forensic science, and the law and expert evidence. Distance learners can complete either a research project or sit for a comprehensive examination. While enrolled, online students must maintain a minimum GPA of 3.0. While not required, virtual degree seekers can visit campus and take advantage of a human identity testing lab, a 320-acre explosive range facility, and a forensic toxicology lab. Applicants must submit transcripts, GRE scores, evidence of a 3.0 GPA or higher, three letters of recommendation, a statement of purpose, and a completed applicant. Enrollment occurs every fall and spring semester. OSU maintains accreditation through the Higher Learning Commission. Situated in the foothills of the Blue Ridge Mountains, Liberty University is a Christian liberal arts institution that serves over 95,000 students online and on-campus. The school's 36 credit MS in criminal justice with a concentration in forensic psychology can be completed in just 18 months. All courses in this accredited online master's degree in forensic psychology are delivered fully online and last eight weeks. The school accepts up to 18 transfer credits. Those who work in law enforcement or first response receive a 25% tuition discount and possible credit for life experience and previous training. Students are introduced to topics such as criminal justice program evaluation, crisis intervention in law enforcement, rehabilitation and reintegration of offenders, and administration of justice organizations. Upon graduation, learners pursue careers in victim support, community corrections, law enforcement, and state prison systems. Online students at Liberty must complete a thesis, which makes this a great program for learners considering doctoral programs. To gain admission, prospective students must complete the admissions application, pay a fee, request transcripts, and show English proficiency. Liberty does not require GRE scores. The school receives accreditation from the Southern Association of Colleges and Schools. Although the University of Houston at Victoria is a public institution, the small student body of approximately 4,500 creates intimate class sizes. An MA in forensic psychology is offered by the School of Arts and Sciences, and can be completed fully online. This 63 credit master's in forensic psychology online takes approximately two years of full-time study — including three courses during each summer term. Students explore topics such as assessment for forensic psychology, theories and issues in psychotherapy, theory and techniques of family therapy, and life-span developmental psychology. To gain admission, learners must demonstrate that they completed coursework in areas of statistics, abnormal psychology, and research methods. They must also provide transcripts, letters of recommendation, a personal statement, and GRE scores. Students can begin UHV's program only in the fall, and they should submit their applications by February 15. As part of the degree requirements, online degree seekers must complete a practicum at an approved facility near their place of residence. This requirement operates in lieu of a thesis or culminating capstone project, but virtual learners must sit for and pass a comprehensive examination to qualify for graduation. They must also maintain a 3.0 GPA while enrolled. UHV maintains accreditation through the Southern Association of Colleges and Schools Commission on Colleges. Some forensic psychology online master’s programs focus on psychological theory, while others spend more time on the criminal justice system and legal theory. Program details vary depending on the school and program chosen. Most programs require students to complete a capstone project, which could be a research paper or field work. During your search, online forensic psychology master's programs often provide varying admissions requirements. All require at least a bachelor's degree from an accredited postsecondary institution, with preference given to candidates with an undergraduate degree in psychology, criminal justice, or a closely related field. Programs may limit admissions to those with an undergraduate GPA of 3.0 or above and ask applicants to submit official GRE or GMAT scores. Some online master’s degree programs in forensic psychology require incoming students to have one or more years of professional experience. This may come in the form of internships, practicums, or a job in the field. Personal or professional references, including letters of recommendation from professors or employers are often requested and bolster students’ applications by highlighting their academic preparedness for the rigor of a master’s program in forensic psychology. Personal essays may also be required. Online master’s in forensic psychology programs teach students skills that can be used in the field. Courses cover topics like research methods in psychology, ethics, and psychological techniques in the courtroom and prisons. Below, is a sample curriculum for an online master’s degree in forensic psychology program. Actual courses vary by school. Techniques of Forensic Practice: This course introduces students to different methods and the methodology used to perform forensic activities, including forensic evaluation to determine competency to stand trial, child custody, and insanity defenses. Psychology and the Law: This course provides an overview of the legal and criminal justice system, including civil, criminal, and family law, from a psychological perspective. It introduces the main theories and methodologies of forensic psychology and provides the skills needed for advanced study. Current Issues in Forensic Psychology: Students study current issues in the field of forensic psychology, which may include eyewitness identification, profiling, risk assessment, jury selection, and other issues currently being debated in the legal and psychology fields. HOW LONG DOES IT TAKE TO GET AN ONLINE MASTER’S DEGREE IN FORENSIC PSYCHOLOGY? Several factors affect the length to complete an online master’s in forensic psychology, including transfer credits, part-time or full-time enrollment status, and whether or not students completed prerequisites prior to enrollment. Other things to consider include the number of credits required to graduate, the number of courses offered each term, if courses are offered year round, and internship or practicum requirements. Programs are usually offered in individual or cohort formats. Individually paced programs let students take as many credits as they can handle, allowing them to graduate sooner. Cohort programs require students to synchronously move through the curriculum with a group of peers, which provides a more traditional, on-campus feel, but takes longer to complete. Each type of learning has advantages and disadvantages. On average, it takes two years of full-time study to graduate from an online master’s in forensic psychology program. How Much Does an Online Master’s in Forensic Psychology Cost? The cost of earning an online forensic psychology master's degree can vary widely depending on the program, and is largely based on whether the school is private or public. On average, getting a master's degree costs between $30,000 and $80,000. As you conduct your search, look at whether each school provides discounts to online learners, such as access to in-state tuition. Also check for any additional fees the college or university charges, such as technology, student activities, and healthcare fees. An increased course load per term may also allow students to graduate early, thereby reducing the total tuition paid. Depending on what career you pursue, passing the National Clinical Mental Health Counseling examination may be required. By passing this exam, you’ll be licensed to pursue a career as a mental health counselor or marriage and family therapist. In addition to regular coursework, an online forensic psychology master's program may also require a hands-on practicum or internship. This involves working alongside forensic psychology professionals to learn about their day-to-day responsibilities in civil and criminal justice systems. Most programs also require the completion of a thesis or capstone to demonstrate your mastery of forensic psychology. This may involve taking one or more classes on research methods, data analysis, and statistics, and then using those concepts to complete an independent project for presentation to program staff before graduation. While looking for online master’s degree programs in forensic psychology, it’s essential to select a program at an accredited school. When a school is accredited, it means that it meets certain standards. Choosing an accredited school is one way to ensure the program’s quality. Schools can be accredited regionally or nationally. Both types of accreditation are recognized by the U.S. Department of Education (ED). Schools with regional accreditation tend to be nonprofit, whereas schools with national accreditation are usually vocational schools. Many regionally accredited schools only accept transfer credit from regionally accredited institutions. Generally, regional accreditation is more prestigious than national accreditation. A few of the regional accrediting agencies to look for when choosing an online school are the Middle States Commission on Higher Education, the Southern Association of Colleges and Schools, and the New England Association of Schools and Colleges. There are no field-specific accrediting agencies for master’s programs in forensic psychology. The ED and the Council for Higher Education Accreditation (CHEA) have a hand in accreditation. The ED creates education policy, organizes federal financial aid programs, and publishes a list of trustworthy accrediting agencies. CHEA is a group of degree-granting universities and colleges in the U.S. that set standards for the accrediting agencies themselves. To see a list of all accredited schools in the U.S., check the ED’s website. Enrollment in graduate programs related to forensic psychology has gone up as the demand for psychological professionals in the criminal justice system also increased. Graduates of online master’s in forensic psychology programs have found growing opportunities in the forensic psychology field, including work as forensic science technicians, intelligence analysts, consultants, researchers, and criminal justice teachers. A master’s in forensic psychology also prepares students for their future goals, such as pursuit of a doctorate in the field or practicing as clinical forensic psychologists. Geographic location can impact the hourly and annual wages of forensic psychologists. The next table presents data from the BLS indicating the top five paying states in the U.S. for practicing psychologists. Graduates of online master’s in forensic psychology programs pursue careers in a range of fields, including family, civil, and criminal courts; law offices; corrections and law enforcement; social service agencies; treatment facilities and other healthcare settings; higher education; and the military. A master’s in forensic psychology also prepares students to become a practicing clinical forensic psychologist, which requires additional training and education. Potential career opportunities for master’s in forensic psychology online program graduates are diverse. Below, we list a few of the most popular options. Forensic psychologists use their psychological training to help explain the behavior and cognitive and emotional processes of individuals in the legal and criminal justice system. They often work in the legal system in roles that involve establishing witness credibility, assessing the mental competence of defendants, or building psychological profiles of suspects. Psychologists usually need to complete an internship and earn a doctorate and a license in order to practice; a master’s degree is acceptable for some related positions. Postsecondary teachers provide instruction to students in a wide range of settings beyond the high school level. Research and publication is often required of postsecondary teachers. Most positions require a doctorate, but many community college teaching positions only require a master’s degree. Police and detectives protect people and gather evidence about crimes. Job duties include writing detailed reports, testifying in court, preparing cases, and observing suspects. Educational requirements vary considerably, but holding a master’s in forensic psychology makes any candidate a more competitive applicant. Below, is salary data for various positions that require an online forensic psychology master's degree. These positions tend to come with considerable salary growth potential as one’s career advances; for example, the average pay for psychologists nearly doubles from their entry-level to late-career stages. Professional organizations for forensic psychology offer numerous opportunities for current students and recent graduates of forensic psychology online master’s programs. Members benefit from networking opportunities that can lead to potential jobs, invitations to annual conferences, and continuing education courses. Being a member of a professional organization will also keep you up to date on the latest issues in the field. A division of the American Psychological Association, the APLS focuses on the intersection of psychology and the law/legal institutions. The organization promotes education, research, and service activities in the field of psychology and law. The IACFP promotes psychological practice in criminal justice and law enforcement settings. The AAFP grants board certification in specialty areas of applied psychology, including forensic psychology. The organization establishes, promotes, and revises the standards for forensic psychologists. Paying for an online forensic psychology master’s degree can seem daunting, but there are numerous financial resources available to online students. Scholarships, grants, student loans, and work study programs all provide options for funding higher education. Prospective students must complete the Free Application for Federal Student Aid (FAFSA) in order to be eligible for financial aid. If students commit to working for the government or a nonprofit group for ten years after graduating, they might qualify for the Public Service Loan Forgiveness Program. Approximately two-thirds of today’s college students rely on loans to fund their education, but plenty of overlooked financing options can help reduce overall student debt. Financial aid for online learning is equivalent to campus-based learning, but that hasn’t always been the case. Learn about the changes that have taken place, as well as the different funding opportunities available to online students. Millions of dollars in free money is available to U.S. military personnel, but much of it goes unused. Learn more about grants, scholarships, and other financial aid opportunities available to veterans, active service members, and reservists.